This has a really fantastic flavor, but this is a very light soup. I think I will probably reserve it for when I am not feeling well and don't have much of an appetite. It's probably the best thing I can imagine eating when you have a cold. Pg. 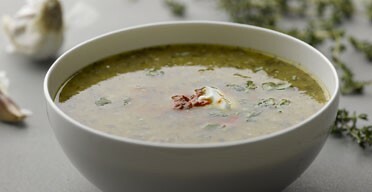 46 Comes together easily and is one of the better garlic soups I have had. The flavour or garlic is definitely present but the herbs and shallots make for a very nuanced soup. I would repeat.